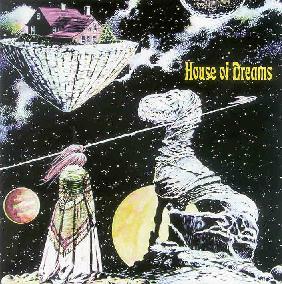 Simon House & Rod Goodway - "House Of Dreams"
According to the Black Widow label the recordings for House Of Dreams started after the tour Simon did with David Bowie (I'm unsure of what year that was). Apparently the recording started and stopped many times during a 15 period and the only mention of their existence was in various interviews. The good folks at Black Widow were aware of these recordings and managed to track them down for release. And it's a good thing they did because this is an excellent set of ten songs with keyboards and violin by Simon and vocals and lyrics by Rod. The music is primarily characterized by a beautiful spacey and orchestral blend of song-oriented progressive rock created by Simon's keyboards and magic violin and pounding rock rhythms. Rod's vocals and lyrics are a perfect match for the music and most of the songs stuck to me on the first listen. Among my favorites are "Curtain Call", "The Reapers Whistle", and "Shadow Land", all of which have a majestic symphonic sound with space and psychedelic elements. "Fancy" is similar but concludes with a gorgeous freakout segment, making it one of my favorite tracks of the set. "Country Charm" is another favorite and the song that gets the deepest into Hawkwind styled space rock territory. "Waiting" is an interesting track, particularly in the beginning where Simon's violin has a Phillip Glass feel. Most of the songs are in the 3-5 minute range, with the title track being the longest at 7+ minutes. It's a decent slice of majestic symphonic progressive rock, with sweeping keyboards and piano, and what is probably the best singing from Goodway on the album. Overall an enjoyable set of songs that are backed by excellent music. Certain to please fans of Simon's music and his contributions to Hawkwind.